Having been badly affected by chemicals in recent years, Annali Lowdon decided to take action – and has come up with a number of practical suggestions as to how both individuals and business can help. If you are chemically sensitive you are constantly at war with your environment. You become that person who complains about your health at work and to your friends and family. The only way I can cope with the frustration of living with these sensitivities and the pollutants that trigger them, is by being pro-active and trying to change the situation for myself and other sufferers. I don’t know when my intolerance to chemicals began. I had childhood asthma but grew out of it; I was a smoker for a few years but quit over 10 years ago. I had no significant problems until 2006 when I was painting the back yard of my house. I seemed to absorb the paint fumes, developed a sinus infection and felt exhausted for days afterwards. In 2008, an ENT consultant prescribed me a combined antibiotic called Septrin to clear a sinus infection. Within 48 hours my hands and lips had swollen up and I went into a slow anaphylaxis. This incident has overshadowed my health ever since and I now react to different allergens in food that never affected me before. I also developed hay fever for the first time. The following year I got a nasty bout of flu. I’d moved into a flat where the only heat source was a log burner. I was laid up for a month with the illness and then post viral fatigue. For about 18 months after whenever I got too hot or tried to exercise I felt as though I still had a burning fever. At this point I decided to try acupuncture. It really did calm down my intolerances and helped me to feel much stronger in myself. It’s quite pricey but I would definitely recommend it to anyone with similar symptoms. Over the last two years these sensitivities have become worse. My biggest problem is timed air fresheners in public toilets. Most people don’t react to them but for me they trigger frequent headaches, migraines, nausea and sinus and chest infections and these days it is a struggle to find a toilet that doesn’t have one. Public places in general are now a nightmare. 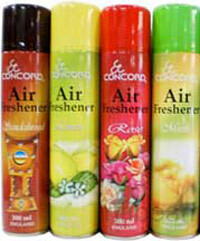 I am surrounded by air fresheners, people’s perfume, fabric softener or washing powder fumes on clothes. Or worse, if the shop you are in stocks scented candles that haven’t been packaged properly or – horrors – the shop assistant has decided to light one for their display…. Last summer whilst suffering from a raging sinus and chest infection, I developed a mild rash around my eyes which turned out to be rosacea. At first the doctor didn’t know what it was so prescribed a steroid cream before referring me to the dermatologist. He thought it might have been triggered by the preservatives in make up wipes and tried a topical anti-inflammatory. 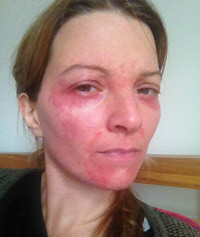 But the rash flares in response to air fresheners, perfume and cleaning products – as you can see. This was inevitably followed by a course of antibiotics. My face took several months to recover and remains too sensitive for me to wear make up more than occasionally. Having read the recent report by the Royal Colleges of Physicians and of Paediatrics and Child Health, I realise that many of the things I have been exposed to over the years are present on their list of harmful pollutants. What I have done about it? I have already written to all my local shops and supermarkets asking them to install air purification systems and better ventilation in their customer toilets rather than using air fresheners. Unsurprisingly, nothing happened. But I realise that as an individual I cannot influence store policy, especially if I’m the only one complaining. I need the backing of other sufferers, a support group, my local community – and I need there to be more awareness of Multiple Chemical Sensitivity (MCS) in the media. If shops and supermarkets hear and see that there’s a problem, then they have a chance to act on customer demand. Swap the air freshener in your public toilet for an air purifier and take measures to improve the ventilation if it is poor. Provide the cleaning staff with products that are approved by Allergy UK, such as Dettol spray. Swap the hand soap to a fragrance free, Allergy UK approved product. Display a sign, announcing that your business has made these changes in support of allergy sufferers to spread public awareness and so other businesses may follow suit. In the case of supermarkets, display the fragrance free Surecare washing powder and Ecover Zero products away from the aisle with the cleaning products so we don’t have to go down there. Ask shop owners selling scented candles to package them properly and never to burn them in the shop. Most people and businesses are simply unaware of the risks posed by air fresheners and it is our job, as sufferers, to tell them – although the government and NHS should also play their part. If you would like to discuss ideas on how to bring about awareness and change I’ve set up a Facebook page, ‘Fragrance Free UK’, aimed at sufferers who want to take action to raise greater awareness with the public, your local NHS, pharmacies and local businesses. Set up an MCS support group for your area with links to the MCS-Aware and Allergy UK websites and Facebook pages. Offer a local paper an article about your story. Write to local businesses, explain your health problems and appeal to them to make small changes that will make a big difference. Ask your local MP to support your campaign or help you to achieve some media coverage on local radio. If you are affected by air-fresheners and would like to join my campaign to ban them from public places please sign my 38 Degrees petition here. MCS isn’t currently recognized as an illness in this country, but is recognized by the World Health Organisation and in many countries around the world. I would like to see MCS officially recognized in the UK and would appeal to consultants, national charities and politicians to work together to make this happen. For further information about fragrance, see our article on Skins Matter – The Growing Problem with Fragrance.